Create Your Favorite Baked Goods In A Smaller Oven! Whether it be a small oven in an apartment or cabin, a countertop oven or a toaster or convection oven in your dorm room or RV, this nonstick baking pan set has got you covered. You don't need to go without, join the latest craze of toaster oven baking! You'll be amazed at the things you can create in your toaster oven, from lasagnas and casseroles to cookies and brownies, the possibilities are endless. Featuring one 9 ½ x 7 x ¾ inch cookie sheet, one 9 ½ x 7 x 1 ¾ inch baking pan, one 8 ¾ x 5 ¾ inch cooling / baking rack and two silicone baking mats to fit in each pan this unique set makes cooking for one a breeze. The pans are non stick so wash up is easy - you can even put them in the dishwasher! And, the silicone baking mats included, eliminate the need for parchment paper not only making them safer but saving you money too! These days everybody wants to eat healthier and the best way to do that is to portion control your food. Don't miss out on your favorite treats, just control your portions! Personal size baking pans are great for healthier cooking as they provide single servings - cooking for 1 has never been easier. Bake, cook, broil, roast or reheat the perfect portion every time. For even healthier cooking try using the stainless steel rack (included) inside the baking pan to elevate your meat or chicken out of the cooking fat giving you a crispier and healthier result. With heavy duty construction to resist warping, these are the perfect accessories for every personal cooking enthusiast. Packaged securely together in a box for protection during transit, this set would be an ideal gift for someone who lives alone, has an RV or is just moving into a dorm room. Grab your set today by clicking the "Add To Cart" tab above and start getting more out of your toaster oven! PLEASE CHECK THESE MEASUREMENTS. One 9 ½ x 7 x ¾ inch cookie sheet. One 9 ½ x 7 x 1 ¾ inch baking pan. One 8 ¾ x 5 ¾ inch cooling / baking rack. Two silicone baking mats to fit in each pan. Whether you're baking a couple of cookies, dorm room brownies or a classic grilled cheese sandwich, this baking pan set has you covered. Don't miss out on your favorite treats, just control your portions! Personal size baking pans are great for healthier cooking as they provide single servings - cooking for 1 has never been easier. Bake, cook, broil, grill, roast or reheat the perfect portion every time. Parchment paper in toaster ovens poses a fire risk! So what can you use as a toaster oven pan liner? 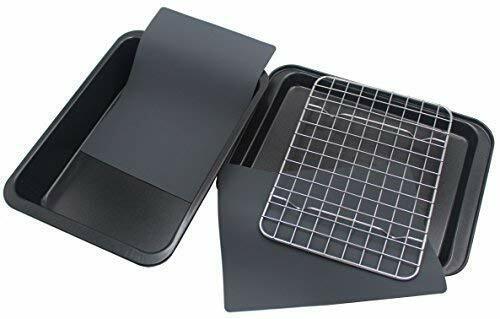 Checkered Chef Toaster Oven Pans are not only nonstick, they also come with silicone baking mats so you'll never need to use hazardous parchment/baking paper in your toaster oven again. The wire grid, stainless steel rack is 100% oven safe and perfect for elevating your food out of the cooking fat to create healthier meals. Fit it inside either pan to cook crispy chicken wings, bacon or steak, or, use it separately as a cooling rack to cool cookies, cakes or brownies that you've baked in the pans. And when you're done, clean up is easy as the entire set is dishwasher safe. Ideal for toaster ovens, small ovens, convection ovens, countertop ovens, RV ovens, camper ovens, air fryers and dorm rooms or just when you want to cook a smaller portion in your regular oven. With heavy duty construction to resist warping, these are the perfect accessories for every personal cooking enthusiast. Packaged securely together in a box for protection during transit, this compact set would be an ideal gift for someone who lives alone, has an RV or is just moving into a dorm room.